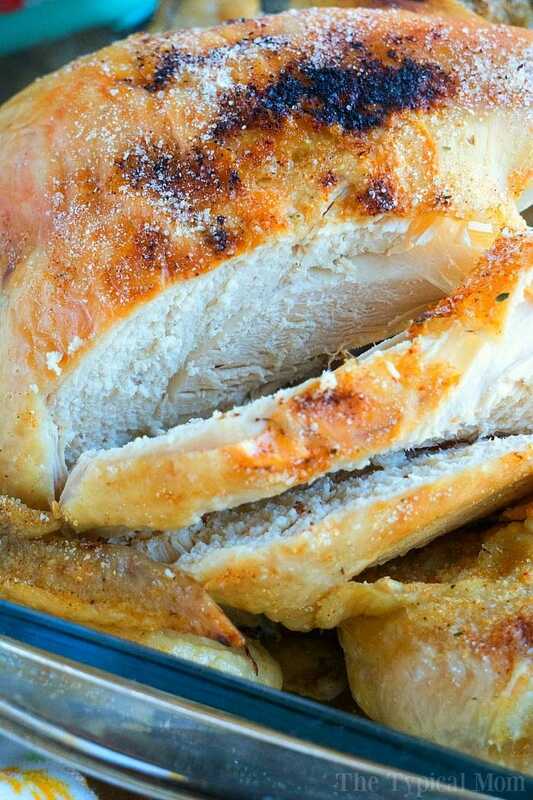 This is how to cook a pressure cooker frozen whole chicken! From rock hard frozen to tender and juicy in 1 hour you’ll always be able to get dinner done. Ever had one of those moments where it’s midday and you realized you never defrosted the whole chicken you wanted to make for dinner??!! 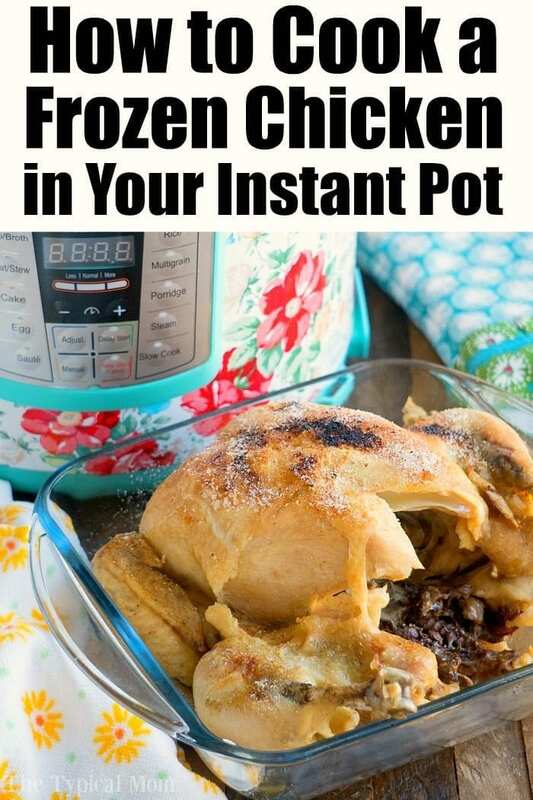 I have, a lot, that is where this pressure cooker frozen whole chicken recipe comes in really handy! Another tip + recipe added to our long list of easy Instant Pot recipes here on The Typical Mom blog. I can’t believe how well this pressure cooker frozen whole chicken turned out! Like I always say, use what you have. If you don’t have chicken stock, use broth. Or just use water. An onion isn’t really a necessity either but I think it adds to the flavor of the chicken. Served on the side it tastes amazing too. Also when your chicken is fall apart done and you remove it DON’T throw away the delicious broth at the bottom. 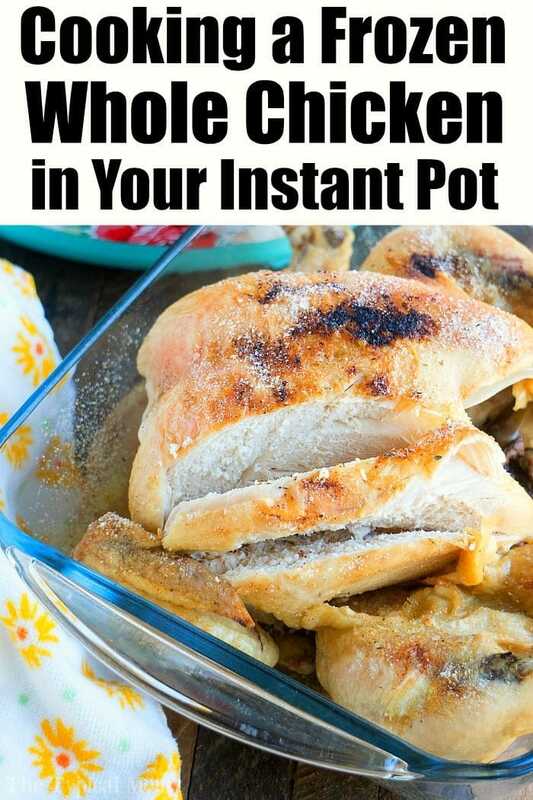 You can use it to make pressure cooker gravy to pour on top of your chicken if you want. Which means you can get a smaller chicken with the same amount of meat as a much larger non organic chicken, and size matters when it comes to fitting a whole chicken inside your pot. That’s my two cents sort a speak, take it or leave it really but thought I’d share my findings. This chicken I bought fresh, then stuck it in the freezer until it was rock hard, and cooked it about a week after purchasing it. I bought it specifically for this post. I wanted to see how well a pressure cooker frozen whole chicken would turn out. What about the giblet bag? I will tell you, I was surprised at how tender and flavorful it was….and like I said, the drippings made for some great gravy to serve on the side. The next time we made this I followed the same recipe but after putting it under the broiler (below photo) I shredded the meat and we made chicken soft tacos. There was so much meat on this little 4.2 lb. chicken we had enough leftovers for lunch the next day. Like I said, there is a huge difference, hardly any fat at all which I prefer. If you’re just going to shred it for tacos though you may not bother with these steps as you may just discard the skin anyway. 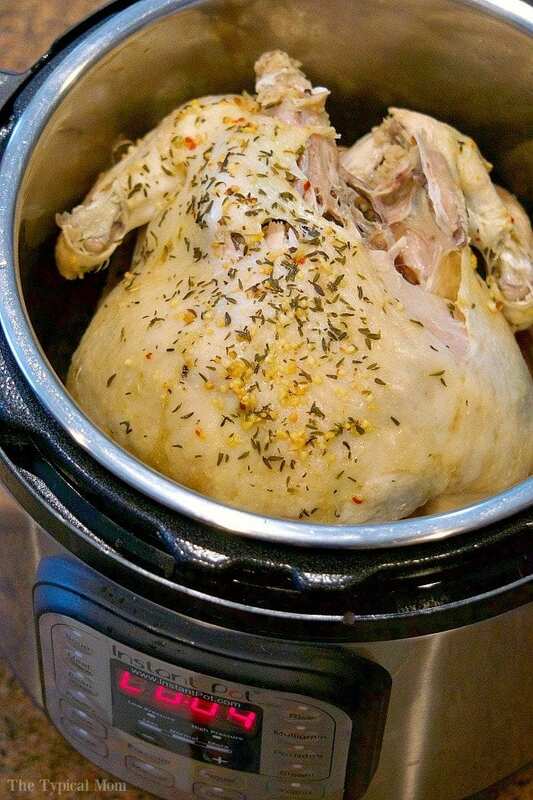 This is how to cook a pressure cooker frozen whole chicken! From rock hard frozen to tender and juicy in 1 hour you'll always be able to get dinner done. Pour chicken broth or water into your pressure cooker followed by your sliced onions. Place your trivet on top of that (if it rests on the onions that is okay). Unwrap your frozen chicken and place it on top of your trivet. Close your lid and steam valve and set to high pressure for 60 minutes. Allow to naturally release steam for 15 minutes. Carefully remove chicken (it will want to fall apart), and put it into an 8x8 dish. Sprinkle the top with seasoning salt, and/or whatever you usually add on top of your whole chicken when you bake it. Turn your broiler on and put your chicken in for 3-4 minutes or until skin crisps up as much as you'd like. I tried this today. I don’t have an IP, but the recipe seemed to use “pressure cooker” as a different thing so I tried it in my Clipso pressure cooker. I added three times the amount of chicken broth and two two largish onions. After 50 min, the broth had boiled away and the onions were burnt. I put it under the broiler, but the skin on top burnt a bit before the sun on the sides became crispy. The chicken was ok, very juicy but with a bit more pink in the middle than I would like. I’ll keep it for a curry. I think that it might be better with an IP rather than a stove-top pressure cooker. Pretty much every recipe you’re going to find online these days is meant for an electric pressure cooker, any brand. The issue with one that isn’t electric is the temp. is not going to stay as steady if it’s on the stovetop in order to follow the timing I, or any other recipe creator, recommends. Tried this today for my very first IP meal. The chicken came up to the max line when I was sautéing it so I just used the driver under the chicken. It came out great. Then cooked the potatoes using the steam mode on high for 10 min & then made gravy. Successful first run! Your cook time and total times are really misleading. With 60 minutes at pressure and a 15 minute natural release that’s an hour and 15 minutes not even taking into account the time to come to pressure. Once you add time to come to pressure you’re looking at bare minimum an hour and half for the whole recipe not an hour and five minutes. All this 10-15 min jobs, then others for 1 hour+ is misleading for frozen chicken…. i need to find chicken, rice recipes with regular situations. This may be a silly question, but do you put the whole chicken in the freezer in the same packaging it came from in the store? If so what about the thingys inside the chicken? Are they cooked along with everything else inside the chicken? 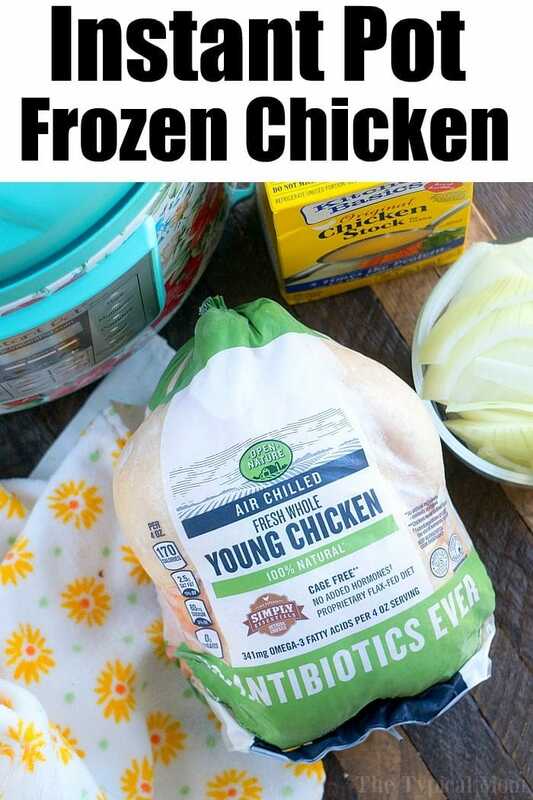 Or do you take them out and repackage the chicken before freezing? 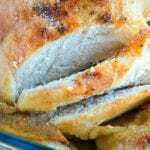 I’m anxious to try this recipe. I added an explanation above to this for you and others.